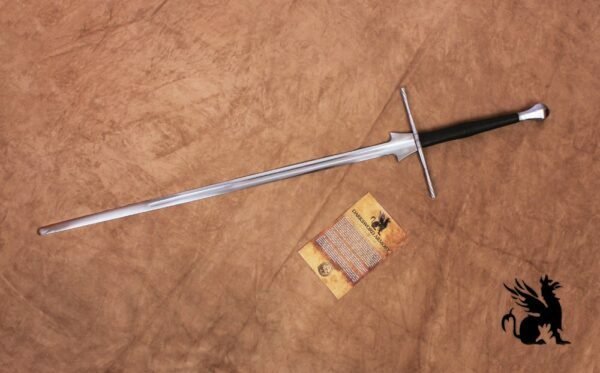 The Federschwert, or feder sword, is a training sword that was used in Fencing schools during the Renaissance. Perfectly designed, the Federschwert served to safely practice full speed combat among practitioners, while reducing the risk of injury. The swords are made following the requirements and guidelines of the HEMA Alliance, with flexible 2mm edge and slightly rounded tips for safety. Responsive, safe and structurally compliant to HEMA combat regulations, our staff has produced these complex and functional designs, able to withstanding the most abusive treatment. The Federschwert, or Feder sword, is a training sword that was used in Fencing schools during the Renaissance. Perfectly designed, the Federschwert served to safely practice full speed combat among practitioners, while reducing the risk of injury. The Federschwert greatest attribute is their similar weight and balance to real swords of the same period. 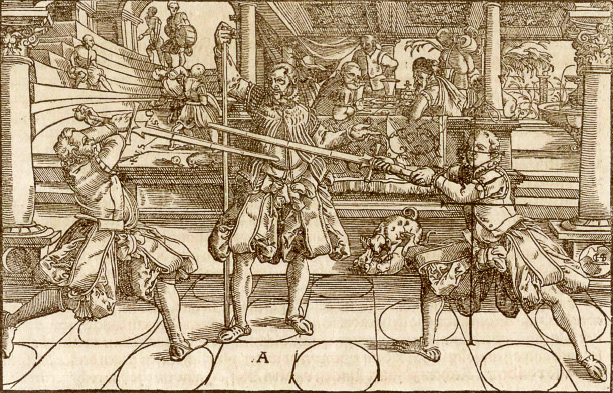 The Federschwert is shown extensively in the fighting manuals of the 16th century, particularly those of Paulus Hector Mair and Joachim Meyer. The Feders can be order with the traditional schilt (as shown) or rounded schilt for safety purposes. Darksword Armory’s Re-enactment & Stage weapons are specifically made for Western Martial Arts (WMA) and HEMA practitioners and theatrical groups. The swords are made following the requirements and guidelines of the HEMA Alliance, with flexible 2mm edge and slightly rounded tips for safety. Responsive, safe and structurally compliant to HEMA combat regulations, our staff has produced these complex and functional designs, able to withstanding the most abusive treatment. All our Re-enactment weapons are fully guaranteed for a period of one year against manufacturing defect. Love the balance, weight, and function of this federshwert. A bit heavier than others, but not in a bad way. Delivers thunderous strikes, and damages lesser swords, with only a few scratches and dings. This is my 3rd sword from Darksword armory. And I have to say I’m very impressed with this federshwert. It is strong and powerful. And I really like the feel of it in my hands. Don’t know why anyone would buy from anyone else. Ok this thing seems indestructible. I pity the other blades it will run across. Truly a professional competition grade federschwert and one any hema practitioner can be proud of. Well worth the extra dollars I spent and glad I did. Its so nice with perfect balance I really am considering buying a lesser blade for my solo pell training and saving this baby for serious bouts. The spiraled handguard is rather unique and leaves no doubt to spectators who the man in all black is. Of course Darksword Armouries Griffon adorns this blade as in all their others, detailed and complete. All in all I must say Darksword armoury really outdid themselves with this federschwert and it gets 5 stars from me easy.